An employment notification for HPTDCL recruitment has been disclosed by the Himachal Pradesh Tourism Development Corporation Limited to inform the most qualified and effective participants for 12 vacant posts of assistant manager. Applicants for eligible jobs can apply for the HPTDC vacancy and can submit the application deadline before 18 February 2019. Qualifications Details: Job seekers must pass B.Sc (Hospitality and Hotel Administration) / MBA (Tourism and Hospitality Management) / Master Degree (Tourism Administration) with good academic records from well-accredited institution. Candidates will get Rs.10 / - for SC / ST / OBC category. 500 / - in the form of application fee. Candidates should be between 18 to 45 years of age 18-01-2019. Monthly remuneration: After the appointment of the applicants, the organization has given them Rs. 10,300 - 34,800 / - 3800 / - with grade pay. Himachal Pradesh Tourism Development Corporation Ltd. Candidates wishing to apply for recruitment will have to undergo a written examination, interview which will be organized by the recruitment panel of the organization. Candidates who wish to apply for the HPTDCL vacancy must go through the organization's official website, http://www.hptdc.in. Once filling the application successfully, the participants should send the application along with all related documents to the address given below. The last date for offline submission of applications is: 18-02-2019. Click HPTDCL Recruitment Notification here. A vacancy notification has been issued by Himachal Pradesh Tourism Development Corporation Limited in the name of HPTDCL recruitment, which is for informing motivated and dynamic people for 06 vacant posts of peon. The eligible person can apply for the HPTDCL vacancy by submitting the application forms through offline mode before the last date 15 January 2019. Eligibility Required: Job seekers should pass 10th / 12th with a good academic record from well-accredited board. Candidates who apply for any of the above mentioned posts and candidates belonging to the general category will have to pay the application fee. 600 / -. Candidates will have to pay the amount related to OBC / ST / SC category. 300 / - in the form of application fee. The claimant who is willing to apply for any of the above mentioned positions should be between 18 to 45 years of age 31-12-2018. On the basis of their attendance in the merit list of job seekers for the above positions will be done, which will be organized on the date fixed by Himachal Pradesh Tourism Development Corporation Limited. The first and most important step is to open the official site, which is http://www.hptdc.in. Once the application has been successfully filled, individuals should send the application along with all related documents at the address given below. Closing date for submission of application: 15-01-2019. 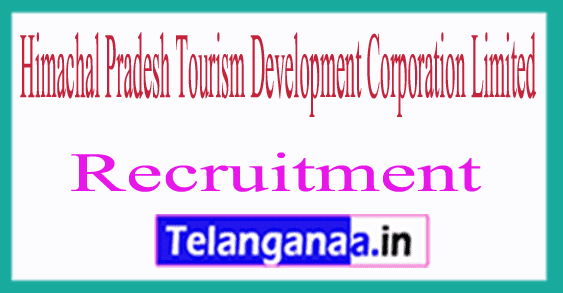 Himachal Pradesh Tourism Development Corporation Limited has given a job advertisement regarding the HPTDCL recruitment to inform qualified and talented Indian citizens for 42 vacancies of the trainee. Eligible job seekers can apply for the HPTDCL vacancy by depositing the application on or before the end date of October 6, 2018, through the offline mode. Eligibility: Those candidates have the minimum qualification because 12th / diploma (Food and Beverage Service / Housekeeping / Food Production / Bakery) / Bachelor Degree / Postgraduate Diploma (Housing / Operations and Management) in the candidates desiring to apply for HDTDCL jobs Should be. Apply from any accredited board or institute. In order to be related to candidates applying for the said position and general category, the application fees of rupees must be paid. 600 / -. SC belongs to the Scheduled Castes / Scheduled Tribes / OBC category. 300 / - in the form of application fee. Candidates should be between 18 and 40 years of 06-10-2018. The first and most important step of the participants is to go to the official site of the organization, which is http://www.hptdc.in.